To what lengths will a true saint go to defend pure doctrine? Fr. Tom tells the incredible story of St. Maximus and St. Martin. 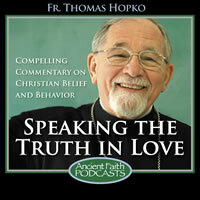 In the second in his series on bishops, Fr. Tom reflects on the New Testament and early Church formulations of the offices and functions of clergy. Fr. Tom talks about the other canons of the fourth century in addition to the Council of Nicaea. The canons discussed today deal with church property, those who would be set apart to read in the divine services, and the appropriate clothing for bishops and clergy.